Maidenhead Civic Society is the town's leading amenity group. It was founded in 1960 at the behest of the Council to represent public opinion on planning matters. Today, with around 350 members, it presents an effective, independent and respected voice on planning and environmental issues. Maybe a housing development doesn't fit. Or it could be a parking problem. Or it might be a campaign for a new cultural or leisure facility for the Town. In fact it can be anything that benefits the community by making Maidenhead a better place. 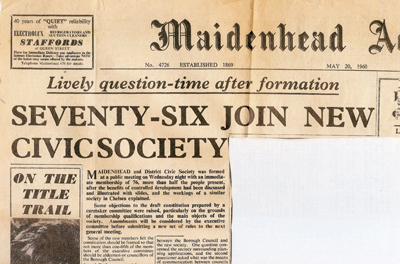 Over the years the Society has successfully lobbied for positive change in Maidenhead. We have implemented a host of projects, like Guards Club Park and the Green Way, enhancing character and amenity, and helped to initiate many others, like the formation of PRoM (Partnership for the Rejuvenation of Maidenhead), which drew up the plans for Town Centre regeneration, adopted in 2011. 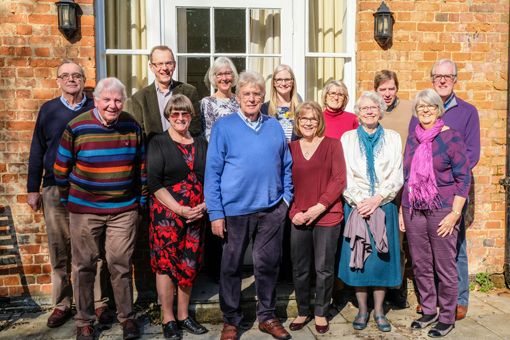 The Society celebrated its Golden Jubilee in 2010 and produced a Special Edition of our quarterly News where you can discover more of the Society's history and achievements. As a registered charity, the Society is governed by an Executive Committee who are the trustees in law. The committee meets several times a year and is responsible for the overall direction of our efforts. The Society, of course, has influence in proportion to the number of its members. That is why YOU and others like you who care about Maidenhead should consider joining us to influence the Town’s development and make the difference. If you care about Maidenhead Join Today! The Society is affiliated to Civic Voice, the national charity for the civic movement.